Well, I finally had some time to get work on getting the home ready for summer! With the Memorial Day Weekend, I am so ready for the summer time! This week, I'll be posting the projects I've been working on. Here is a simple seasonal "trick" that I do constantly. It's not really a trick, but it is a simple solution to changing the look of a room without spending a zillion dollars. It's your pillows! 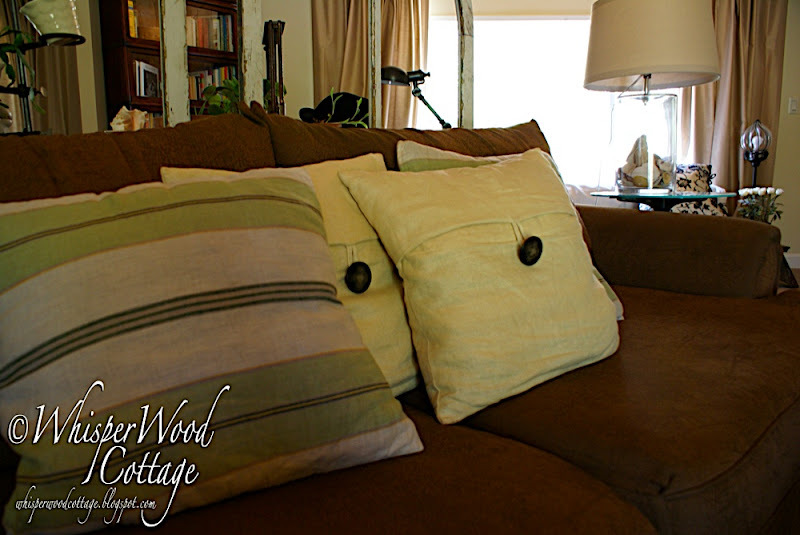 Changing out the pillow covers makes for a quick rejuvenation of a space. Where do I get the pillows and pillow covers? These particular pillow covers are Pottery Barn covers that I found on e-bay or on sale in the store. My mom and I have also perviously sewn some before (see my These are a Few of My Favorite Things post from November 2008). I like to get the pillow inserts from clearance pillows at TJMaxx. A lot of pillows at TJMaxx have covers that are zippered and come off for cleaning. Even if the pillow cover is not your taste, you can often get a high-quality feather insert for a lot less than buying them at a fabric store or Pottery Barn. I like to change things up constantly. It takes up less space to store a pillow cover than to store a pillow. So, it is possible to have a dozen pillow covers in the same space as storing one pillow. 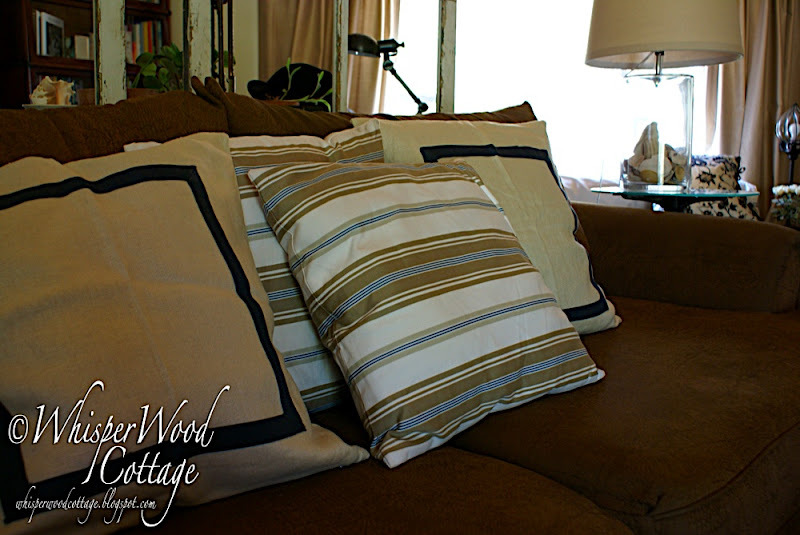 Pillow covers are washable/dry cleanable! Does anybody else do this? Why or why not? Where do you find your pillows and pillow covers? Any tips or tricks? I love this! And I do it all the time too-except I can't sew so I usually rely on my hot glue gun. It usually holds up until I ready for a change again. I've found that beautiful cloth napkins are great for this! I love the summer beachy look. My pillows migrate on their own from room to room! They, apparently, like change too! I do this with pillows, but my couch which was my parents and is a wonderfully made piece of furniture also has quite the wardrobe. It means I can change the look of the couch or room frequently and all are wash and wear. I made a pattern for slipcovers about 10 years ago and have gotten pretty familiar with how to use it. I'm not a great seamstress, but I make it all work. I like your new pillow covers. I have several pillows, but I'd love to make or buy some new covers for them...just to change things up a little. Wow, that's really smart! Great idea! Once again you have outclevered yourself. I end up selling pillows at yard sales. I don't sew, but I bet I could use that ironing stuff that seals things up. Surely it would last for a season! I love Pottery Barn pillow covers (and everything else)! And changing just the pillows really does make an impact. But I'm not quite as smart as you though, girl! I seem to always change the whole pillow! It would be much smarter to do what you do. Right now I have some awesome pillows Sue Wolfe (from the Round Barn) made for me on burlap that she stenciled "Hello" in several different languages. They were just too cool to pass up! looks great! Love that idea! Love this idea, I wish I was more of a seasonal girl, I just have the same pillows all of the time, boring! I get inserts at TJMAXX too! wow they look terrific! I need to do this too! Thanks for visiting my blog today! I'm enjoying going back through your older posts and reading everything! I love the change for the seasons... i do this as well and with my throws. It lightens everything up. They look really good. Very refreshing and summerish!!! Love the summer look. Great way to change the sofa up. I get my pillow inserts at thrift or consignment stores. I squeeze until I find a feather one, and then I decide if I like the price. Goodwill often has brand-new Target overstocks, and I've found several at $4/each. Like you said, it doesn't matter if I like the cover or not.